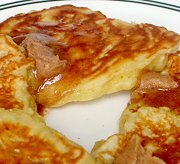 Apple pancakes are a yummy snack and a great way to open the day. In a large bowl, combine the biscuit mix, sweetener, baking powder, cinnamon and salt. In a small bowl, combine the egg substitute, milk and vanilla. Stir into dry ingredients. Fold in apple. Pour mixture by 1/4 cupfuls onto a hot skillet coated with cooking spray. Turn when bubbles form on top.